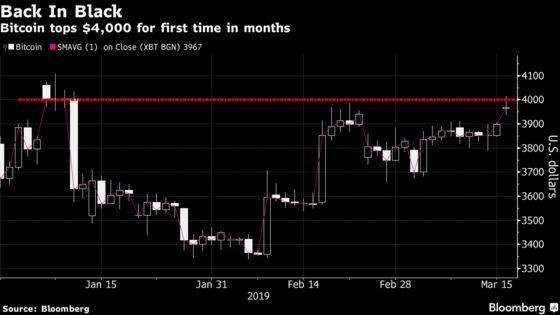 (Bloomberg) -- Bitcoin broke above $4,000 for the first time since early January, a milestone seen as significant by at least one well-known crypto bull after weeks of sideways trading. It’s a key level for many close watchers of the coin, who painstakingly saw its price lurch lower in 2018. Bitcoin fell close to $3,150 in December, a staggering 80 percent drop from a record $19,511 just a year prior. Monday marks the first time it crossed the $4,000 level during weekday trading since Jan. 9.